Members of a Mearns community have spoken out about their concerns regarding a lack of sports and swimming facilities. Laurencekirk Development Trust (LDT) held a public meeting last Tuesday (April 21) to air concerns over the lack of sports facilities, including a swimming pool, included in the design of the new Mearns Academy. Mike Robson of the LDT said: “A well-supported public meeting was held at the Mearns Academy Campus to discuss the prospects for community action to deliver a range of sport and other community facilities not addressed when the new academy was built. The meeting was called by LDT who have carried out preliminary studies to establish the most economic model to adopt to meet the needs of the area. 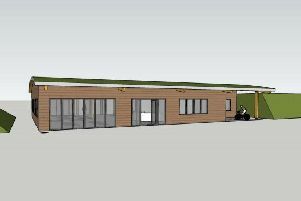 “Aberdeenshire received financial assistance from the Scottish Futures Trust towards the cost of a “like for like” new building. “However, the community have been bitterly disappointed by the failure to realise local aspirations to have a swimming pool included for the community served by Mearns Academy. Children receive minimal or no swimming during their schooling omitting a basic life skill from their curriculum. Aberdeenshire Council officers, councillors and community councillors attended the meeting to explain the current circumstances and the inability to provide any more sport or leisure facilities during the current period of austerity. Mr Robson added: “The community would now like to retain the former playing field and the old academy site – situated across the road from the new campus. This would provide the ideal site for use by the school and retain an existing facility. “Among the arguments is the fact that the new site is fully occupied and is locked between the railway line and the main road with nowhere to accommodate any future expansion. There is real concern that Aberdeenshire Councillors will vote to sell the former site to cover the financial shortfall of the new build. It is hoped that with public support, Scottish Government policy to support local initiatives and the Community Empowerment Bill this disappointment can be turned into a real success story for Aberdeenshire”.